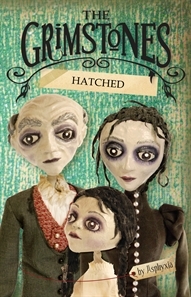 I just had to draw everyone's attention to this gorgeous little book "Hatched" which is the first in "The Grimstones" series for children aged 9-12. Based on a very successful children's show where the story is told by marionettes, the book is illustrated with pictures of the marionettes and props from the show. The story has been described as a gothic fairytale, and is told by Martha Grimstone who lives in a grand old house with her Grandpa Grimstone, her Aunt Gertrude, and her mother, Velvetta. Her father, Mortimer died when she was a baby and her mother has never got over his death, crying all the time and dreaming of the babies that they would have had together. The Grimstones are no ordinary family, but a magical one and her grandfather is well known for his potions to heal people. When he refuses to teach Martha the spell to make her mother the baby she desperately wants, Martha sneaks into his apothecary and tries to do it herself. But things don't work out, and little Crumpet emerges from his egg with three legs. This is a story of how society doesn't always accept people who are different - something that the author, Aspyhia, is intimately related to as a deaf person in a hearing society. You can catch the show at The Famous Spiegeltent at the Arts Centre in Melbourne on Sunday 26th February 2012 at 11 a.m.